The Cellular Jail, which is also known as Kala Paani (Black water), is the most prominent landmark of Port Blair as well as the entire Andaman and Nicobar Islands.The small islands here were the home to British colonists during India’s pre-independence period. The city is famous for the historic Cellular Jail where the Indian freedom fighters were imprisoned and tortured brutally by British. 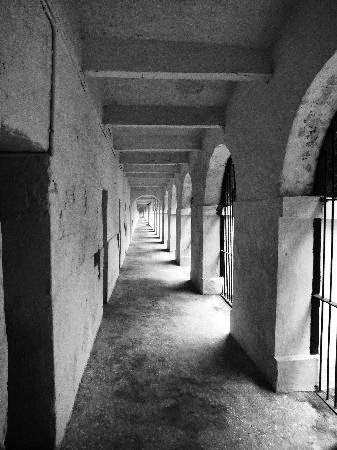 The Cellular Jail has to tell many stories of cruelty of British rulers and hardships suffered by the prisoners in this isolated island. No visitor can leave this place without tears in their eyes. Today, the complex serves as a national memorial monument. The cells were just 13′ by 7′ in size. The back wall had a 3’ x 2’ high ventilator with a sill height of 10’. British had been using Andaman and Nicobar Islands to imprison and punish the Indian convicts since immediately after the first War of Indian Independence. Soon after suppression of rebellion, the British executed many rebels. Those who survived were exiled to Andaman and Nicobar Islands to prevent them from re-offending. They brought two hundred freedom fighters to the islands. Later many prisoners were transported to the islands from Burma and India. British considered this place as a suitable place for punishing the freedom fighters. The isolation of the islands from mainland and the overseas journey to reach here threatened the prisoners with loss of caste that result in social exclusion. Many people were died due to diseases and those who survived were used to colonies the island for the British by constructing prisons, buildings and harbour facilities. 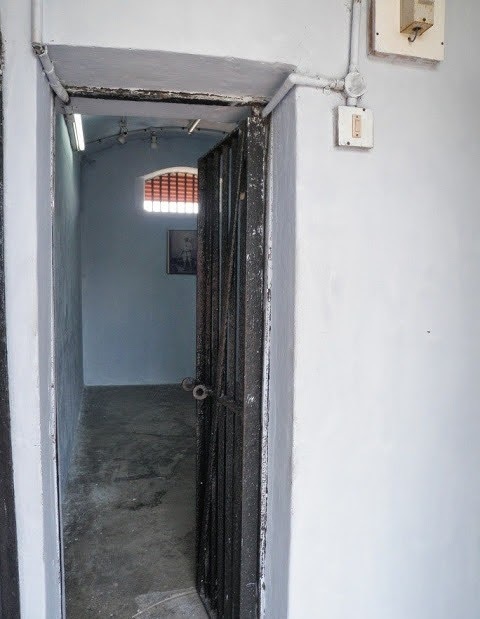 Some of the famous prisoners of the Cellular Jail were Vinayak Damodar Savarkar, babarao Savarkar, Sohan Singh, Nand Gopal, Shadan Chandra Chatterjee, vaman Rao Joshi, Yogendra Shukla, batukeshwar Dutt, Maulana Ahmadullah and Movli Abdul Rahim Sadicpuri. During Second World War Japanese drove the British out and invaded the Andaman and Nicobar Islands. Thus, the Jail is occupied by British prisoners. But, British continued control of the Island with the end of Second World War. “We were to be yoked like animals to the handle that turned the wheel .Hardly out of bed, we were ordered to wear a strip of cloth, were shut up in our cell and made to turn the wheel of the oil mill. The door was opened only when meal was announced. The man came in and served the meal in the pan and went away and the door was shut. If after washing his hands one were to wipe away the perspiration of his body,the sweeper who was the worst of gangsters in the whole lot would go at him with loud abuse. There was no water for washing hands. Drinking water was to be had only by propitiating the sweeper, while you were at oil machine; you felt very thirsty. The water-man gave no water except for a consideration which was to palm off to him some tobacco in exchange. If one spoke to sweeper his retort was,” A prisoner is given only two cups of water and you have already consumed three. Whence can I bring you more water? From your father?” we have put down the retort of the sweeper in the most decent language possible. 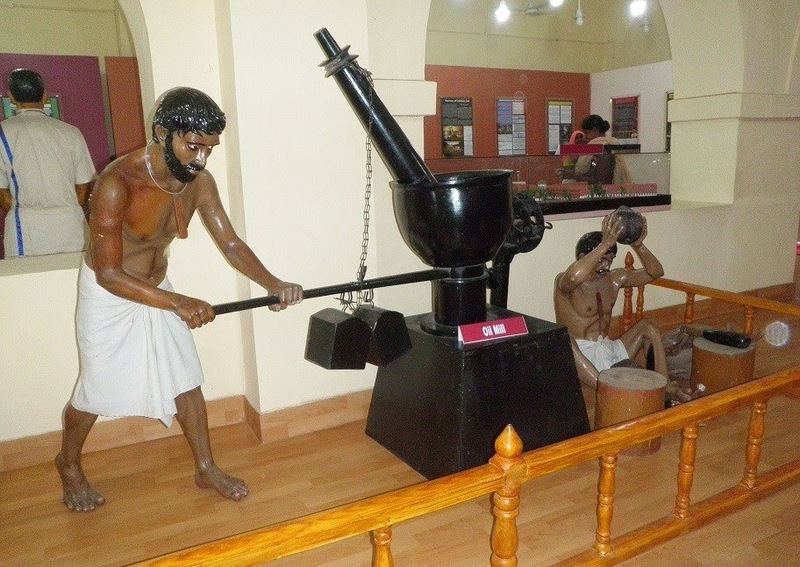 If water could not be had for wash and drink what can be said of water for bathing?” The picture below depicts the oil mill in Cellular jail. After Independence, two wings of the Cellular Jail were demolished. But, several former prisoners and political leaders protested it, as they thought that would erase the tangible evidence of the torture they suffered. So, the central tower and the remaining three wings were converted into a National Memorial in 1969.